Strategic Thinking is all about working on the future of your business. develop a Think Rhythm that puts strategic thinking in your flight path every year, every quarter, every week and even daily. identify aspects of your core business that could be tightened to ensure sustainable growth. choose and work on the right winning moves to that will double your revenue over the next 3-5 years. get rid of losing moves that steal your energy, time and resources. 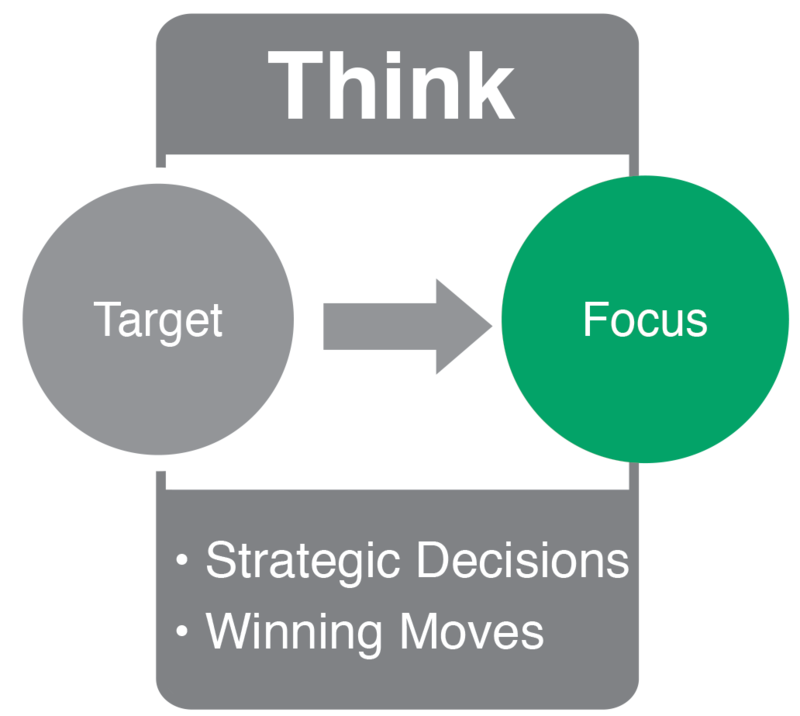 Establishing a rhythm of strategic thinking, part of the Think Plan Do methodology, creates a focus for the future of your business. This is the time you set aside for strategic planning: thinking about the competitive, economic, and political landscape; analyzing opportunities and threats, and brainstorming and testing new revenue generating ideas. We recommend spending this think time iteratively, putting it in your weekly flight path so that you flex your strategic muscles on a regular basis. We help. Below are all the most important proven aspects of strategic planning that our software and consulting team will help you work on. Visit each page to learn more. Core Purpose - Your Core Purpose will keep you on-track as you make strategic moves, ensuring your team is aligned to a common reason for being. Core Values - Core values are the handful of guiding principles by which a company navigates. Core Competencies - Core Competencies are unique systems and processes that make you operationally different and superior to your competition. your company to achieve greatness. Brand Promise - Your Brand Promise is the promise you're making to your customers that both really matters to them and makes you different from your competitors. Winning Moves - Winning Moves are strategic decisions and actions that enable you to double your business within 3-5 years. 3-5 Year Plan - Your 3-5 Year Plan can be viewed as a base camp on the way to the summit that is your BHAG. SWOT - SWOT analysis is a planning method used to evaluate the Strengths, Weaknesses, Opportunities, and Threats involved in a project or business venture.